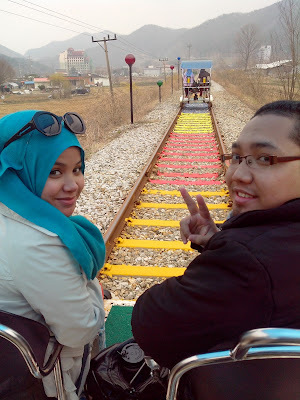 After having breakfast, we transfered to Yangpyeong and went for a rail bike ride. The rail bike is a 4-seat vehicle that moves on rails by foot pedaling(obviously). Since I was pregnant, my husband insisted I let him do all the pedaling. In the end I tried pedaling anyway and the thing moved even with the slightest pedaling, pffft. Tipah tertipu rupanya. haha. The rail bike looks kinda lame I know, but trust me, totally fun when you ride it with the right people! :) Plus we got to see more of South Korea's country side and even the friendly Koreans who waved at us as we passed by. After about an hour at the rail bike station, we went to the DIY Kimchi place in Icheon(forgive me, I really don't remember the name of this place) and made some Kimchi(well, kind of). To be completely honest all the ingredients were there already, we just happen to squeeze everything into the cabbage. Our Kimchi instructor was funny though, reminded me of that runningman guy, Jea Suk or whatever his name is. I don't really fancy the taste of Kimchi since I feel that our local sambal is so much tastier, but apparently koreans love it because according to them, not only does it taste good, but it is also very healthy food that they take everyday, apart from Ginseng. Just opposite the Kimchi place, we had the oppurtunity of wearing the Korean traditional garments. I wore the Hanbok(dress) + Jokduri(headgear) while hubby wore the Gwanbok + Tanggeon. If you look at the traditional attire of any country around the world, you'll find that most of them are very modest. Makes you wonder why not many cultures wear any of the (slightly modified) traditional garments in everyday life like how the Arabs still wear their Abayas/Burqa/niqab or the Malays who still wear their Baju Kurung. Across the street from the Kimchi & tradional wear place, was the Seasonal Fruits Farm where we did some strawberry picking( really reminds me of the days back in uk) The strawberries in Malaysia are not as sweet or as tasty as the ones in korea/uk so my mom bought a whole big box of korean strawberries to bring back to Malaysia but most of it was finished before we even reached Malaysia. Having my cinderella moment right there. ooooh i didn't know korea have that themepark!makes me want to go to Korea so much more! what a beatiful pic!! I feel like wanna go there!!! This is a vacation or you stay there,Kak Aishah?? Amazing, sounds like a very fun filled day! Bulgogi is sweet! I had a bulgogi dish sometime back in Seoul Garden Hotplate (there's one in Singapore) and I didn't like it at all as well. Anyway, masyAllah, you're looking radiant and glowing Aishah! May Allah ease your affairs ameen. Sending love from Singapore. teringin diri nak ke sana,insyallah jika Allah izinkan,semua itu tak kemana..
haha, still the malaysian dish is the best... huhu, but of course the strawberry taste sweeter , because you picked it fresh! You looks pretty with the turquoise scarf! Bulgogi is sweet. Because they marinate it with asian pear to make it tender. Sometimes they use kiwi too. I actually like it that way! you are glowing ma sha Allah. Stay away from sushi! oh wait do they serve sushi in Korea? I'm a new subscriber to your blog, I just found it. You're adorable. Please check out my blog too. I converted to Islam a year ago and married my husband. I'm still adjusting to life as a Muslimah and how different it is.